Want to drive around town and deliver Amazon Prime Now packages for up to $25 an hour? A new service called Amazon Flex launched today offering that very gig, starting in Seattle and rolling out to nine other major U.S. cities in the coming months. 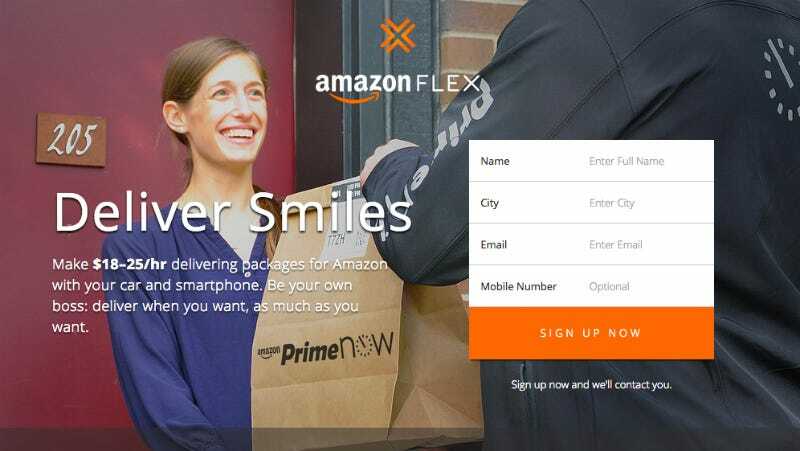 “Deliver smiles” and “be your own boss,” the Amazon Flex page tells us. It says you can make $18 to $25 an hour working part-time bringing neighbors the wares they ordered on the one-hour delivery platform Amazon Prime Now. You set your own schedule and work shifts that are two, four, or eight hours long. After Seattle, Flex will expand to New York (Manhattan), Baltimore, Miami, Dallas, Austin, Chicago, Indianapolis, Atlanta, and Portland. Flex joins services like Instacart, TaskRabbit, and other services that employ strangers to bounce around town to run your errands and fetch stuff to bring to your doorstop. It’s a gig economy world, and we just live in it, which often means screwing employees out of proper benefits and job security that full-time employees enjoy. Grab your car keys and ready your Galaxies.